A messenger style cotton/canvas sling bag with Elizabeth Zimmermann's well-known quotation: "Knit on, with confidence and hope, through all crises" and signature screen-printed onto it. 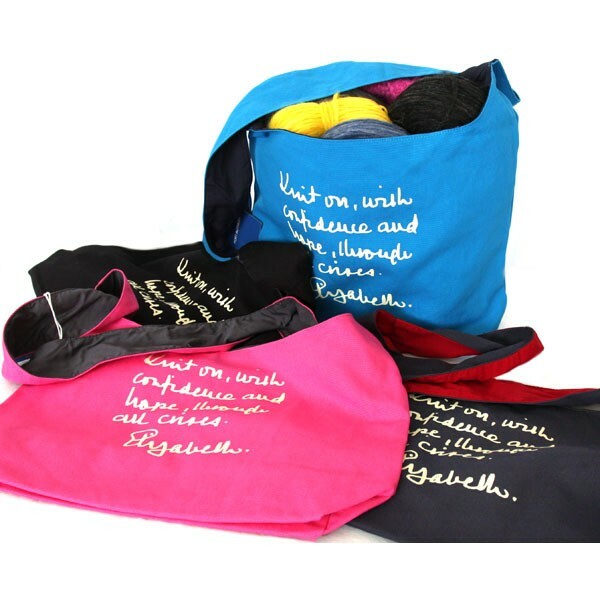 Each bag has a small inside zippered pocket in its colored lining. Colors: Navy/ Chili Red lining; Black/ Charcoal lining; Tropical Pink/Charcoal lining, Turquoise/ Navy lining. Dimensions:18" wide x 11" high with a 4.5" wide base. *Items shown in bag sold separately.